Identification: The genus Cipangopaludina can be identified by its relatively large globose shells and concentrically marked opercula (Burch 1980). 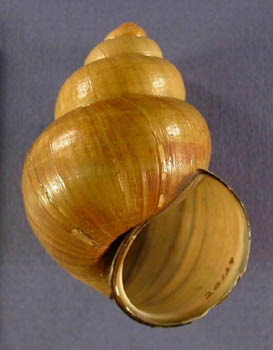 Cipangopaludina japonica exhibits a shell with 7–8 whorls, a very narrow umbilicus, and a spire that is produced at an angle of 50–55º (Jokinen 1992). Adult shells display fine carinae, while those of juveniles are covered in hairs on the periostracum where the carinae are located as well as around 8 striae/mm between the carinae in the middle of each whorl (Smith 2000). Individuals are light colored as juveniles and dark brown as adults (Wolfert and Hiltunen 1968). The shell of C. japonica grows allometrically, the height increasing faster than the width, and does so at an increased rate in comparison with C. chinensis, so the adult shell is more elongate than that of the latter species (Jokinen 1982). The radula also may differ between C. japonica and C. chinensis, but there is so much variation even within one species that it is not a good diagnostic characteristic (Smith 2000). However, in one North American population, C. japonica adults had five small cusps on either side of the large central cusp and nine cusps on the marginal tooth (Jokinen 1982). Size: can reach 50 mm. In Lake Erie, adults range from 30–65 mm high and 22–46 mm wide; females are slightly larger than males when mature (Wolfert and Hiltunen 1968). Native Range: Cipangopaludina japonica is native to mesotrophic and eutrophic lakes in Japan (Jokinen 1992). Native to Japan, Taiwan, and Korea. Table 1. States with nonindigenous occurrences, the earliest and latest observations in each state, and the tally and names of HUCs with observations†. Names and dates are hyperlinked to their relevant specimen records. The list of references for all nonindigenous occurrences of Cipangopaludina japonica are found here. Ecology: The Japanese mystery snail is known to feed on detritus and sludge, both of which contain a myriad of different types of bacteria (Kurihara and Kadowaki 1988). In Japan, this species is commonly found in rice paddy fields on soil amongst higher plants (Kurihara and Kadowaki 1988). Lives in freshwater rivers and lakes. The Japanese mystery snail in Sandusky Bay, Lake Erie, survives in conditions where surface water temperatures may reach 30ºC, bottom water temperatures can reach 16–24ºC, water is 4 m deep or less, there is high turbidity, the substrate is mud, and aquatic vegetation is sparse (Wolfert and Hiltunen 1968). It sometimes undergoes mortality events in marshes around Sandusky Bay in hot periods when waters dry up (Wolfert and Hiltunen 1968). In general in North America, the Japanese mystery snail has been found inhabiting waters of pH 6.3–7.3, calcium concentration of 11 ppm, sodium concentration of 16 ppm and conductivity of 62–194 μmhos/cm (Jokinen 1992). This species is viviparous (Wolfert and Hiltunen 1968), giving birth to crawling young. Females live up to 8 years and are able to carry 10–120 young (Jokinen 1992). Young are generally born after water temperature rises to 15ºC or more (Jokinen 1992). The Japanese mystery snail is a host to Angiostrongylus cantonensis larvae in Taiwan, a species associated with eosinophilic meningitis (Lin and Chen 1980). It is also host to many other parasites in Asia, some of which may infect humans. Means of Introduction: Imported to West Coast into Asian food market about 1892. Deliberate release to the Great Lakes where it was intentionally stocked as food for the channel catfish, Ictalurus punctatus in Lake Erie in the 1940s (Mills et al. 1993, Wolfert and Hiltunen 1968). Status: Established in US. This species is considered established in Lake Erie and reported from Lake Michigan. A) Realized: This species has been caught in very large numbers by fishermen in Sandusky Bay, Lake Erie; in fact, two tons have sometimes been caught in one seine haul (Wolfert and Hiltunen 1968). Fishermen in this region often consider it a nuisance (Wolfert and Hiltunen 1968). B) Potential: In the Boston area, the Japanese mystery snail has been found to be a regular host to the common native parasite Aspidogaster conchicola, which is a first time record in North America for a gastropod acting as host to this species (Michelson 1970). Negative interactions with native gastropods are also possible. Remarks: Taxonomy of the introduced populations of Oriental mystery snails is confusing and there are many different scientific names in use. There has also been debate regarding whether or not C. chinensis malleata and C. japonica in North America are synonymous and simply different phenotypes of the same species. This database considers the two as separate species. Smith (2000) argues that Cipangopaludina is a subgenus of Bellamya; however, because most North American literature does not use the genus Bellamya to refer to these introduced snails, oriental mystery snails discussed here are referred to by Cipangopaludina. Burch, J.B. 1980. A guide to the fresh water snails of the Philippines. Malacological Review 13(1-2):121-144. Havel, J.E. 2011. Survival of the exotic Chinese mystery snail (Cipangopaludina chinensis malleata) during air exposure and implications for overland dispersal by boats. Hydrobiologia DOI: 10.1007/s10750-010-0566-3. 8pp. Jokinen, E.H. 1982. Cipangopaludina chinensis (Gastropoda: Viviparidae) in North America, review and update. Nautilus 96(3):89-95. Jokinen, E.H 1992. The Freshwater Snails (Mollusca: Gastropoda) of New York State. The University of the State of New York, The State Education Department, The New York State Museum, Albany, New York 12230. 112 pp. Karatayev, A.Y., L.E. Burlakova, V.A. Karatayev, and D.K. Padilla. 2009. Introduction, distribution, spread, and impacts of exotic freshwater gastropods in Texas. Hydrobiologia 619: 181-194. Kurihara, Y., and K.I. Kadowaki. 1988. Effect of different ecological conditions on the mud snail Cipangopaludina japonica in submerged paddy soil. Biology and Fertility of Soils 6(4):292-297. Lin, C.Y. and S.N. Chen. 1980. Epidemiologic studies of angiostrongyliasis in north Taiwan. Medical Journal of Osaka University 31(1-2):7-12. Mackie, G.L. 2000. Introduction of molluscs through the import for live food. Pp. 305-313 in R. Claudi and J.H. Leach, eds. Nonindigenous Freshwater Organisms: Vectors, Biology and Impacts. CRC Press LLC, Boca Raton, Florida. 464 pp. Michelson, E.H. 1970. Aspidogaster conchicola from fresh water gastropods in the USA. Journal of Parasitology 56(4):709-712. Smith, D.G. 2000. Notes on the taxonomy of introduced Bellamya (Gastropoda: Viviparidae) species in northeastern North America. Nautilus 114(2):31-37. Wolfert, D.R., and J.K. Hiltunen. 1968. Distribution and abundance of the Japanese snail Viviparus japonicus, and associated macrobenthos in Sandusky Bay, Ohio. Ohio Journal of Science 68(1):32-40.